along the Bay of Fundy Coast. 8 Spruce Lane, Alma, N.B. We are one hour's drive from Moncton, which is the largest city center and offers the nearest airport. 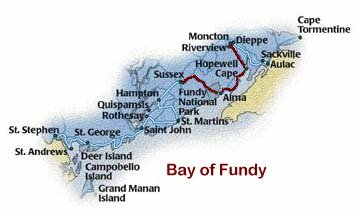 As well, we are only 45 minutes from the beautiful dairy town of Sussex and one hour, 30 minutes to the Port City of Saint John.